Have you seen Jurassic World yet? It’s breaking all sorts of box office records, and I think it’s absolutely fantastic. So much fun! 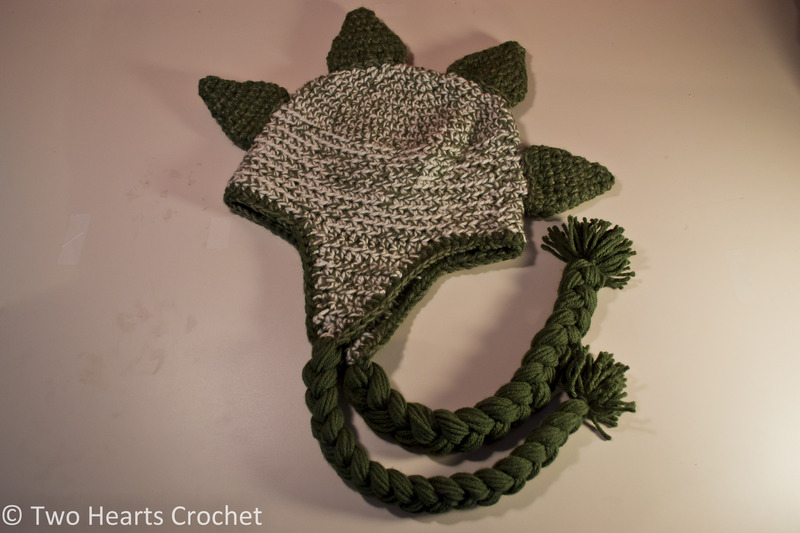 To celebrate (and to boast my love of all things dinosaur), I’ve finally posted my long-used and much-loved pattern for a crocheted dinosaur hat with dino spikes. I hope it brings you as much fun as it has brought me, my brother and my nephew! NOTE: This pattern is worked with two strands of yarn simultaneously, making it nice and thick. 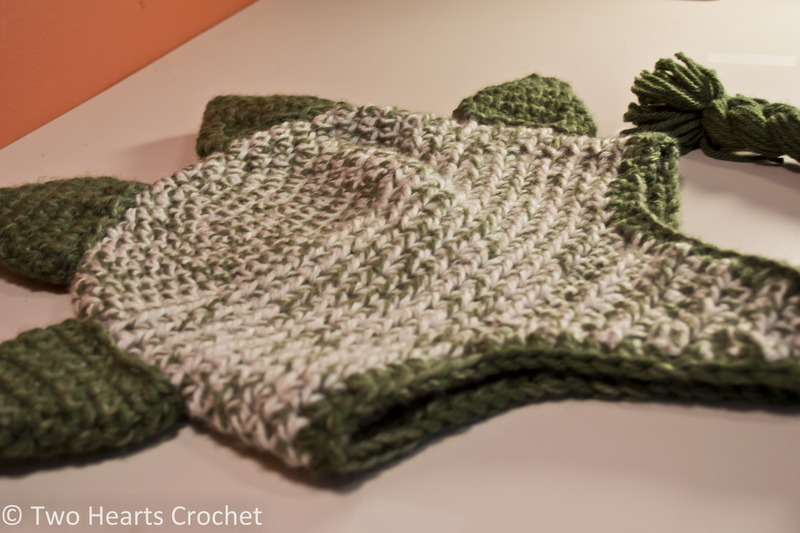 If you prefer, you can work the same pattern with just one strand of yarn. NOTE: For some sizes, it may be necessary to add or remove some of the straight hdc rows that are worked after the crown of the hat is done, depending on the length you desire for the beanie. Yarn colors: light gray, medium green and dark green (I used up some yarns from my stash, which were mostly Red Heart yarns). Rnd 1) With gray and medium green, make a magic circle. Ch 2. Make 8 hdc inside the circle. Join to beginning of the round and ch 2. Rnd 6-12) 1 hdc in each st around. Join to beginning of the round and ch 2. Rnd 13) 1 hdc in each st around. Join to beginning of the round and fasten off. Weave in ends. Continue to Earflaps. Rnd 17) 1 hdc in each st around. Join to beginning of the round and fasten off. Weave in ends. Continue to Earflaps. Rnd 19) 1 hdc in each st around. Join to beginning of the round and fasten off. Weave in ends. Continue to Earflaps. Rnd 20) 1 hdc in each st around. Join to beginning of the round and fasten off. Weave in ends. Continue to Earflaps. Rnd 9-18) 1 hdc in each st around. Join to beginning of the round and ch 2. Rnd 8) *2 hdc in first st, 1 hdc in each of the next 6 sts* – repeat seven times. For the remainder of the round, work 1 hdc into each of the remaining sts. Join to beginning of the round and ch 2. Rnd 221 hdc in each st around. Join to beginning of the round and fasten off. Weave in ends. Continue to Earflaps. Rnd 23) 1 hdc in each st around. Join to beginning of the round and fasten off. Weave in ends. Continue to Earflaps. Rnd 24) 1 hdc in each st around. Join to beginning of the round and fasten off. Weave in ends. Continue to Earflaps. Rnd 11-24) 1 hdc in each st around. Join to beginning of the round and ch 2. Rnd 25) 1 hdc in each st around. Join to beginning of the round and fasten off. Weave in ends. Continue to Earflaps. Rnd 1) With gray and medium green, insert your hook into any stitch of the last round of the base of the hat. Ch 2. Starting in the next available st: hdc in each of the next 8 sts. Ch 2 and turn. Rnd 2) hdc2tog, hdc in each of the next 4 sts, hdc2tog. Ch 2 and turn. Rnd 3) Work 1 hdc in each st across. Ch 2 and turn. Rnd 4) hdc2tog, hdc in each of the next 2 sts, hdc2tog. Ch 2 and turn. Rnd 5) Work 1 hdc in each st across. Ch 2 and turn. Rnd 6) hdc2tog. Fasten off, leaving a long tail. Continue to Earflap #2. Count 16 stitches away from start of first earflap (this will be the distance between the two earflaps in the front). Rnd 6) hdc2tog. Fasten off, leaving a long tail. Continue to Hat Trim. Rnd 1) With gray and medium green, insert your hook into any stitch of the last round of the base of the hat. Ch 2. Starting in the next available st: hdc in each of the next 10 sts. Ch 2 and turn. Rnd 2) hdc2tog, hdc in each of the next 6 sts, hdc2tog. Ch 2 and turn. Rnd 4) hdc2tog, hdc in each of the next 4 sts, hdc2tog. Ch 2 and turn. Rnd 6) hdc2tog, hdc in each of the next 2 sts, hdc2tog. Ch 2 and turn. Rnd 7) Work 1 hdc in each st across. Ch 2 and turn. Rnd 8) hdc2tog. Fasten off, leaving a long tail. Continue to Earflap #2. Rnd 8) hdc2tog. Fasten off, leaving a long tail. Continue to Hat Trim. Rnd 1) Insert your hook into any stitch along the rim of the hat (I usually start at the back of the hat between the earflaps, just to hide my seams). With medium and dark green, ch 1. Work 1 sc in each st around. Join to the beginning of the round and fasten off, leaving a long tail. Weave in ends. Continue to Tails. Cut 60 long strands (approximately 2’ in length) of dark green yarn. Divide into two piles (one for left earflap, one for right earflap). Insert a larger hook (Size K recommended) into the tip of the earflap where the trim stitches meet the earflap itself. Gently pull the yarn strands through the stitch. (See photos to get a better idea if necessary. After you pull the strands through about halfway, stop. Make sure there are even amounts of yarn hanging from either side of the earflap. Divide the yarn tails into three sections and braid together. Fasten the braided yarn ends together by tying a small strand of dark green yarn securely around the bottom of the braid. Trim ends to desired length. Repeat for the second earflap. Continue to Dino Spikes. Rnd 1) With medium and dark green, make a Magic Circle. Ch 2. Work 6 hdc in the center of the circle. Join to the beginning of the round and ch 2. Rnd 2) Work 1 hdc in each st around. Join and ch 2. Rnd 3) Work 2 hdc in each st around. Join and ch 2. Rnd 4) Work 1 hdc in each st around. Join and ch 2. Rnd 5) *Work 2 hdc in the first st, 1 hdc in next st* – repeat around. Join and ch 2. Rnd 6) Work 1 hdc in each st around. Join and ch 2. Rnd 7) *Work 2 hdc in the first st, 1 hdc in next 2 sts* – repeat around. Join and ch 2. Rnd 8) Work 1 hdc in each st around. Join and fasten off, leaving a long tail. 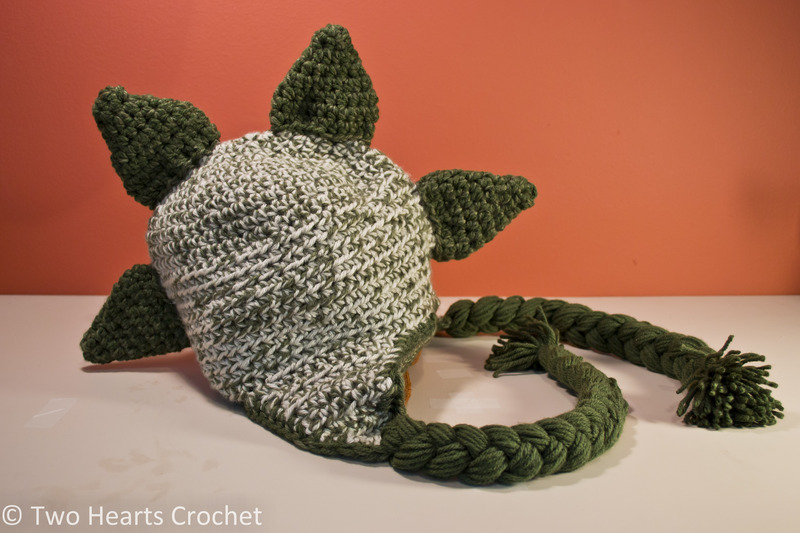 Using a yarn needle and the tail ends of the yarn, carefully sew the Dino Spikes to the base of the hat. Weave in ends. And there you have it! Rawr! I have always loved this pattern, and my little brother and my nephew do too. In fact, my little brother saw this hat in an incomplete state (I hadn’t even made the spikes or tails yet! ), and he knew right away that it was a dinosaur hat for him! The smart little cookie! I can’t wait to give him this dinosaur hat. I know he’s just as excited about it as I am, and I hope you all love this pattern as much as I do!